The Spirit of Mother Jones festival will include a series of lectures exploring the origins and role of the Irish Citizen Army, a workers army, in the Easter 1916 rebellion. The venue for the lectures will be the Firkin Crane, Shandon, Cork. Date and Time: Friday, 31st July 2015 at 3.30pm. The 1916 Proclamation of the Irish Republic refers to just three organisations, one of which is The Irish Citizen Army (ICA). On Easter Monday morning 1916, over 200 members of the ICA, men, women and boys marched into a revolution in Dublin led by James Connolly. 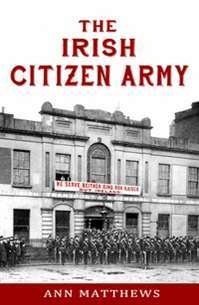 The Irish Citizen Army comprised almost 30% of those who actually turned up for the Rising on that Monday morning and represented an internal mobilisation of almost 80% of the available and active membership. 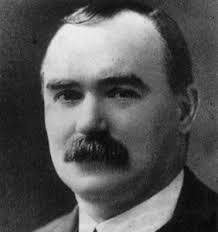 Some 50 including Connolly, who had played a central role in planning the actual military attacks,occupied the General Post Office. The remainder of the ICA played an active part in some of the fiercest fighting witnessed during the week in places such as St Stephen’s Green, College of Surgeons, City Hall and Dublin Castle. Copies of the 1916 Proclamation itself was printed by the ICA at the Co-Op Stores at No 31 Eden Quay, alongside Liberty Hall, the headquarters of the Irish Transport and General Workers Union. Considerable quantities of the weapons, bombs and explosives used later in the Rising were stored in Liberty Hall, even the flag which flew over the GPO was created there. 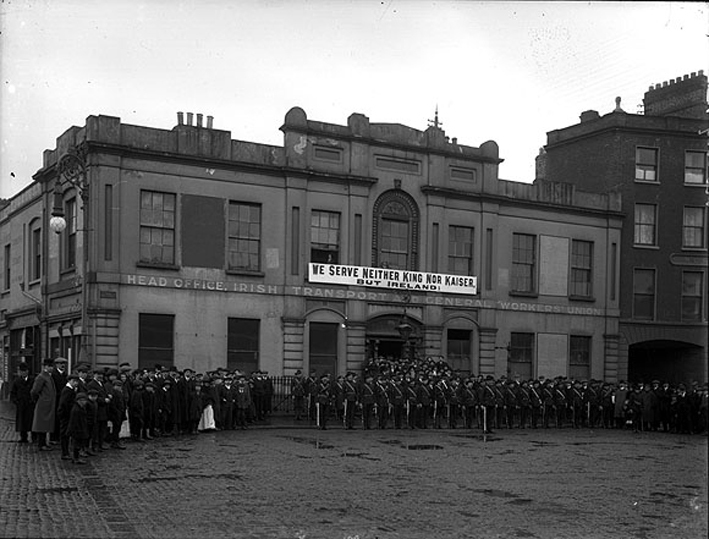 Many of the active participants in the Rising had spent the Easter weekend in and around Liberty Hall, and marched from there to seize various buildings. 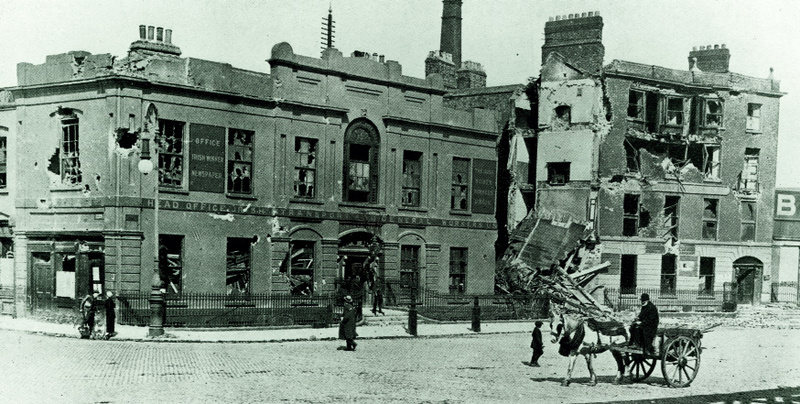 Liberty Hall itself was bombed by the British initially as they immediately understood that the rebellion had been organised from there, the building was wrecked during the attack. Sean Connolly of the ICA fired the first shot of the Rising, which killed Sergeant James O’Brien at the gates of Dublin Castle. In a strange twist of faith, Connolly himself was the first casualty on the rebel side when he was killed by a sniper an hour later. At the very end, Elizabeth O’Farrell of the ICA was with Padraig Pearse at the formal surrender of the rebels near the GPO, while she also carried the orders and dispatches which confirmed the cease fire and surrender elsewhere in Dublin. Yet they were pushed to the margins of history soon afterwards and virtually disappeared from the narrative of Irish history for a considerable time, even during the 1966 commemorations. Who were these working class men and women, so many of whom were killed or injured in the Rising or imprisoned or impoverished in its aftermath? By any standards The Irish Citizen Army was central to the 1916 Rising itself. It provided thecatalyst which set off the explosion leading to eventual Independence. Its origins among workers in the 1913 Lockout, its first Commandant ….. a Boer War hero, its voice unique and its participants brave, its discipline and ideological stance which set it apart in Ireland even in a period of dissent and conflict. The Army was led by one of the greatest socialist agitators and thinkers of the 20th Century. Yet why is its legacy so uncertain, why is its central contribution considered a curiosity of history and why were its beliefs swamped by the conservative ideology which followed? Earlier on the 1st August 1915, by order of James Connolly, the Irish Citizen Army had also gathered initially at Liberty Hall to participate alongside the Irish Transport and General Workers’ Union in the funeral procession for the Fenian leader Jeremiah O’Donovan Rossa, (born in West Cork and a “Freeman of Cork City” who had died on 29th June 1915 in America) to Glasnevin Cemetery. Led by the James Fintan Lawlor Band, The Citizen Army and the Irish Volunteers marching side by side put on a hugely impressive show of force accompanied by the trade union movement, the Irish Republican Brotherhood and Cumann na mBan as they marched north to the Cemetery. Standing nearby, Connolly could see the Rising as a reality. Almost 100 years to the day, on Friday evening 31st July 2015 at 3.30pm, the Cork Mother Jones Committee will hold a series of lectures at the Firkin Crane entitled “The Irish Citizen Army and theRoad to the 1916 Rising”.The lectures and discussion will explore the origins, the progress and the eventual participation of this workers’ army in the 1916 rebellion. How important was its contribution, the role of James Connolly, what caused its subsequent political isolation and relative obscurity in Irish history? Dr Ann Matthews, author “The Irish Citizen Army” Mercier Press 2014. 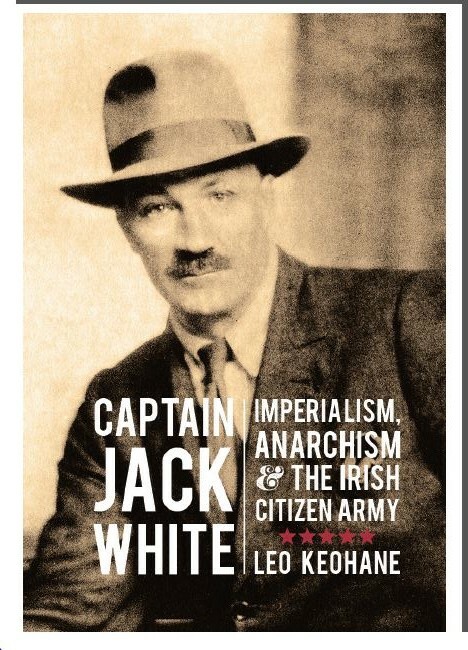 Dr Leo Keohane, author “Captain Jack White, Imperialism, Anarchism &The Irish Citizen Army” Merrion Press 2014.